Go here to sign Kristi's Mr.Linky so we can see what's in your mailbox! 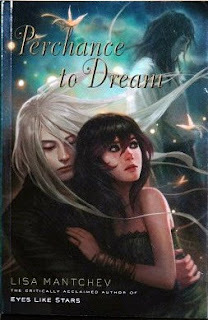 Anyway, something that came as a surprise (a great one) is my arc for Perchance To Dream (book 2 in the Théâtre Illuminata series). I'm currently rereading Eyes Like Stars so I can start this one up! I'm slowly becoming a huge Jennifer Echols fan. Going Too Far was a great book, so I've been meaning to look at her others. Well, it turns out my roommate/bff is awesome! Why? Because my she bought me a couple Jennifer Echols ebooks for my nook! The Boys Next Door looks like it's about a love triangle between 2 brothers and a girl named Lori. It's told through Lori's pov. I've read about 50 pages and so far, it's pretty good! The Ex Games. Hmm, think battle of the sexes/exes with skiing. I'm pretty excited about this one. The Bookchick recommended it and she hasn't failed me yet! And that's pretty much all I've got for you this week. Thanks for reading my first In My Mailbox. Hope you enjoyed it! Looks like some fun reads! My mailbox is at The Crowded Leaf. And yes I very much enjoyed reading your IMM. Perchance to Dream looks very interesting. I've yet to read Eyes Like Stars though. Never seen any of those.